My Little Patch of Sunshine: Gevalia Coffee Giveaway! 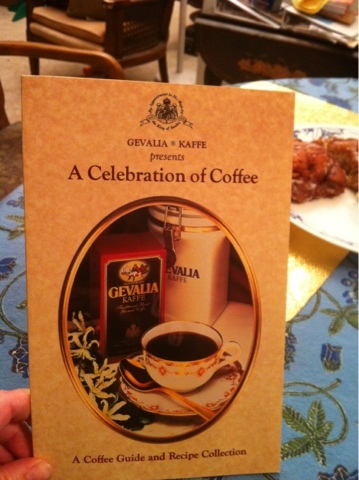 As a kid, I can remember my parents receiving Gevalia Coffee in the mail. They loved receiving their boxes of coffee, and it was the only kind they drank for a long time. When I mentioned the coffee to my mom, she said "OH! I think I still have their cookbook!" Sure enough, she did! Gevalia coffee is now available at your favorite retailer, as well as via mail order subscription! I have seen it at Target recently, as well as Safeway. Their full collection of coffees is available online, but you will find some of the favorites at local stores. Look for the distinctive, bright yellow bags. Thanks to Gevalia and MyBlogSpark, I have 2 bags of wonderful coffee to give away, as well as a nice ceramic mug. MANDATORY QUESTION: How many cups of coffee do you drink in a day? Giveaway will end March 12, 2012. To enter the giveaway, do NOT leave a comment below. (But feel free to leave a comment about anything else! Just not to enter the giveaway.) Click THIS LINK and fill out the simple form. If you want to know my giveaway rules, check out the link on the right sidebar. I do think you should send Gevalia both videos.